Steve Schrader is one of those individuals. A veteran of the United States Air Force, Steve flew F-16s during his career, posted in Germany, Korea, Japan, Alaska, and Italy. He served as a squadron commander and vice wing commander at Aviano Air Base and participated in combat operations over Iraq and Kosovo. Steve served as a joint staff political-military affairs officer, where he was assigned as a country officer to both Pakistan and Afghanistan. After twenty-six years on active duty, Steve could have easily retired into satisfaction, hanging his hat on an impressive career of service to this nation. But he felt a calling to continue serving the ideals that he defended in uniform—freedom, generosity, and dignity for all. So, Steve and his wife Diane began a new mission: welcoming the world’s most vulnerable. Steve continues to act with love, selflessness, and compassion, leading a Parishes Organized to Welcome Refugees (POWR) team in the Cape Cod area. The United States Conference of Catholic Bishops launched POWR in 2010 and have since helped thousands of refugee clients with pro bono legal counsel, medical services, the English language, finding employment, friendship, and social integration. Steve and Diane have welcomed into their home many refugee families from all over the globe. They continue to lead and organize regional “Airport Welcomes,” where volunteers greet newly arrived refugees stepping onto U.S. soil, making them feel welcome on their first night in America. I can’t think of a better introduction to the best of this nation. 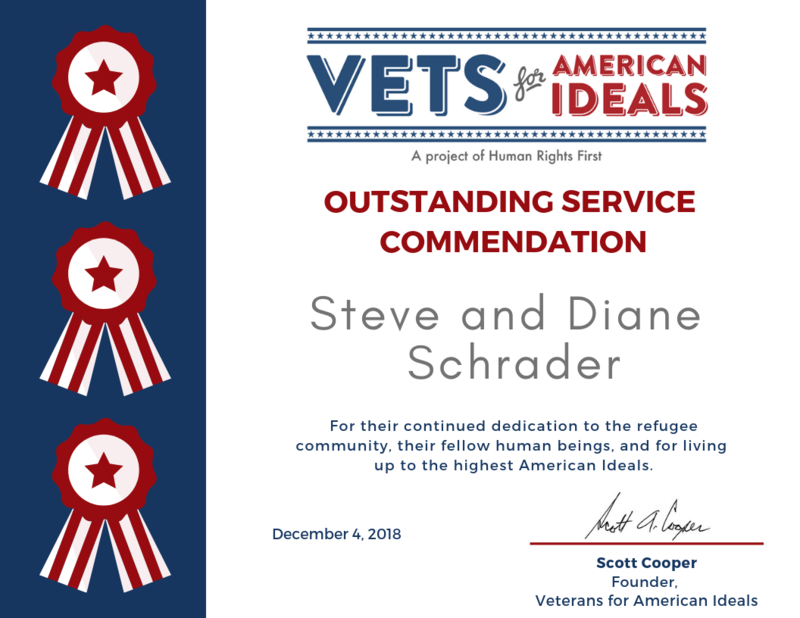 The Schraders not only provide refugees with a soft landing; they also strive to give them a running start by supporting them in their job and housing searches. Today, every refugee Steve and Diane helped are employed and contributing members of the community. A Southwest Airlines pilot, Steve remains an active member of the VFAI-Boston team and joined us last year on Capitol Hill to lobby on behalf of the Special Immigrant Visa program and press for U.S. leadership on refugee protection. Steve and Diane have rich legacy of servant leadership. We’re pleased to present them with a Vets for American Ideals Outstanding Service Commendation.